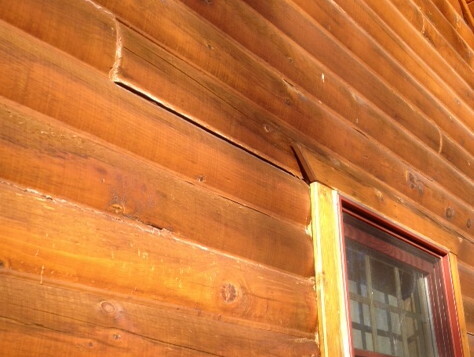 Sometimes log homes develop leaks which become evident during a driving rain. It can be very discouraging to find a puddle of water on the floor and have no idea where the water is getting in. 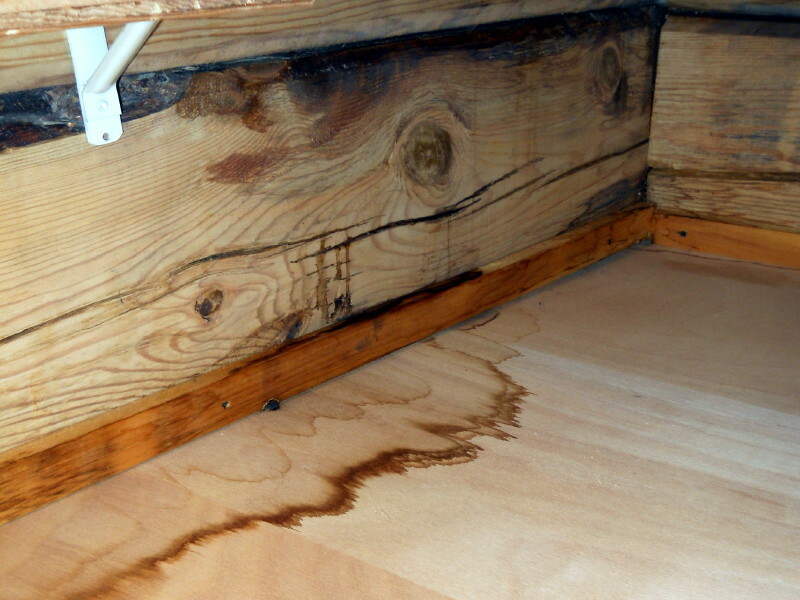 Leaks can often leave an unsightly water stain behind once the logs dry out. Water leaked inside this log cabin and caused major staining on the interior logs. If your log home is chinked, the leaking may be caused by a gap in the chinking where the seal has been broken along the chink line. Even a narrow gap can cause problems. It is important to check all the chink lines in the area surrounding the leak. Water can travel along a log until it finds a way into your home, so don’t just check the immediate area on the other side of the wall. It could be coming from somewhere above and traveling down the logs. When caulk or chink pulls away or falls out, it can let in moisture around windows, which can lead to rot! If your home is not chinked, the leaking most likely is caused by cracks or checks in the logs. Again, water that gets into a log through a crack on the up-side of the log can travel along the log and exit away from the crack. These are often tricky to detect. Sometimes the leaking is due to caulking that has cracked or failed. The checks over 1/4″ wide. They on the up or top side of the log surface. They in vulnerable places such as around windows, doors, where a deck is attached, etc. When water is leaking into your home, air is also leaking in, which can mean a loss of heat during colder months. This is another reason to make sure to keep chink lines in good condition and caulk those checks. Don’t have the time to do this. Let us help. Call 715-373-5744.